Description of decorations: Rocks and pebbles in different size, collected from woods and rivers in Germany; Twig; Grey riversand 0-2mm (from Colorstone); Lava granules hidden under heightening in right corner. Description of equipment: Dennerle Trocal LED 24 W, 5500 K, dimmed with net tissue; Tunze Nanostream 6020, 2500 L/h (functions also as filtration together with porous lava granules); Air pump during summer to increase oxygen. Water parameters: Temperature: 19-26°C; pH: 7.2; gH: 11. Description of the area surrounding the biotope: The Tung Chung River starts at an altitude of 880 metres at Lantau Peak and flows through the north of Lantau Island. It consists of three main streams. It ends in the sea southwest of Tung Chung new town. The river goes through forests and urban areas. The broad riverbed of the middle reach flows between bushes and trees, but is not shaded by the trees, so algae can grow easily. 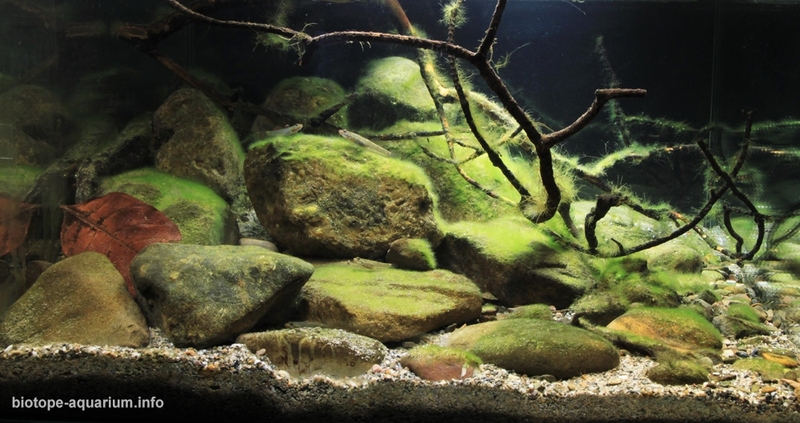 Description of the underwater landscape of the biotope: In the upper reach the water flows slowly. The soft water is clear and shaded by trees. 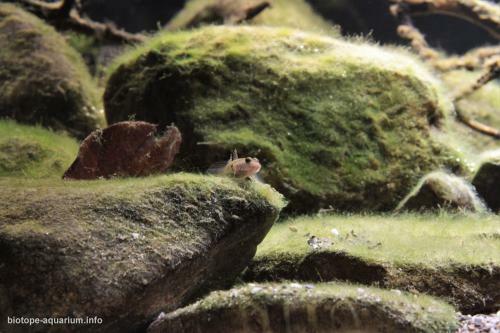 Rocks and leaflitter provide a lot of aufwuchs for Caridina spec. (e.g cantonensis). The riverbed of the middle reach consists partly of huge rocks (e.g. granite) that reach out of the water and starts to flow much stronger. It forms waterfalls and deeper waterholes with stones and pebbles overgrown with plenty of algae. 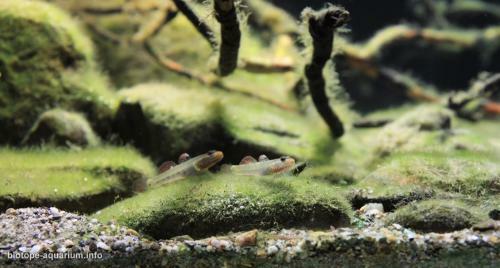 Only few shrimps are found here anymore because of predatory fish like Rhinogobius spec. that dig in the sandy substrate to lay their eggs under stones. Description of the parameters of the habitat: The water is clear and transparent. Temperatures reach from 16 to 28°C (air temperature). pH ranges from 6.0 to 9.0. 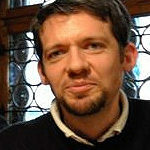 List of fishes and invertebrates occurring in the nature biotope: For example Pseudogastromyzon myersi, Schistura hingi, Barbodes semifasciolatus, Rhinogobius duospilus, Caridina cantonensis. Threats to the ecology: Regarding the Environmental Protection Department of Hong Kong the water quality of Tung Chung River and other rivers on Lantau Island is excellent. 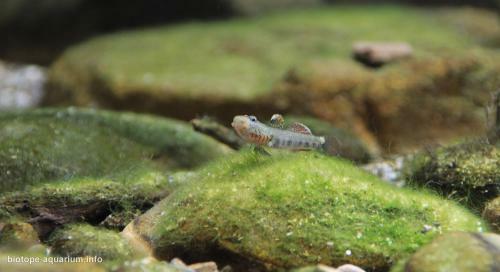 Still a loss of aquatic wildlife is recorded in Tung Chung stream. Rare fish like Acrossocheilus beijiangensis and the more common Parazacco spilurus nearly disappeared. Reasons for this loss of aquatic wildlife could be building projects and damage from illegal excavation work. This very natural-looking Chinese stream biotope is an accurate representation of the habitat it is modelled on. The abundant algal growth on both stones and branches closely resembles segments of the actual location, as do the types of river stone, sand, and scattered leaves. 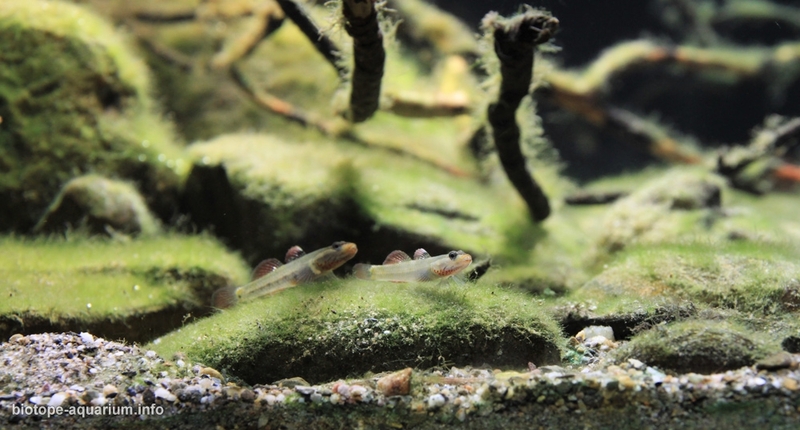 The layout of the tank affords the Rhinogobius the platforms, visual barriers, and hiding spaces they need to show their instinctual display, foraging, and courtship behaviors. 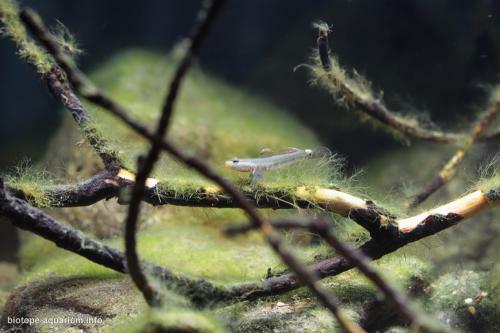 I thought that using porous lava granules within the aquascape itself as biological filtration was a nice touch, as it mimics bacterial growth in the wild habitat. Overall, this biotope shows the kind of “wild and woolly” rawness that we would find in nature.